Garlic pork chops, roasted baby potatoes & buttery green beans with a white wine cream sauce. Roast baby potatoes Place on a tin foil lined baking tray, drizzle with olive oil and season with salt and pepper. Mix and arrange in a single layer, then roast for 15-20 minutes until golden. Green beans: Place a pot on medium-high heat, add the green beans with enough boiling water to cover by 2cm. Add a pinch of salt and blanch for 3-4 minutes until bright green and cooked, but with a slight bite. Drain and melt over a small knob of butter and season with salt & pepper. Pork chops: Place a dry pan on medium-high heat. Cut perpendicular slits (about 2cm apart) all the way along the fatty edge of each chop to prevent it from curling up in the pan. Drizzle with olive oil and coat in garlic seasoning and salt & pepper. When the pan is hot, add the chops and sear for 3-4 minutes a side. Hold the chop on its fat edge for 1 minute to crisp it up. Set aside, keep warm. Cream Sauce: In the same pan on medium- high heat add the white wine. Simmer (gently boil) for 30 seconds – 1 minute until reduced by more than half. Add the cream and thyme and season with salt and pepper. Simmer for 1 minute until thickened slightly and remove from the heat. 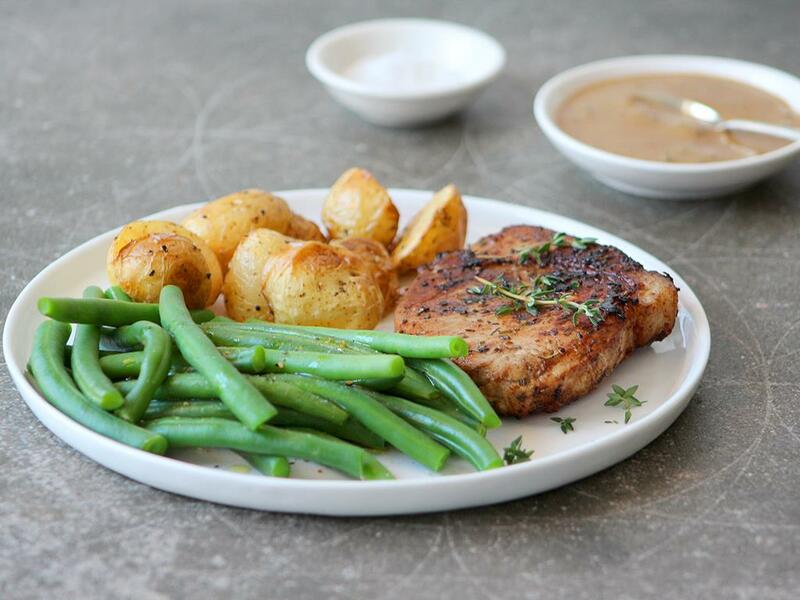 Serve the pork chops, baby potatoes and green beans with the cream sauce.